The Greater Madison County Chamber of Commerce uses the Annual Banquet to recognize outstanding Chamber members, individuals and businesses in our community. At the 2018 Banquet, October 8th, we will present awards for Small Business of the Year, Large Business of the Year, Young Professional of the Year, and the Best in Customer Service Award. Recipients of these awards are nominated and voted on by members of our community and represent the best of our community. 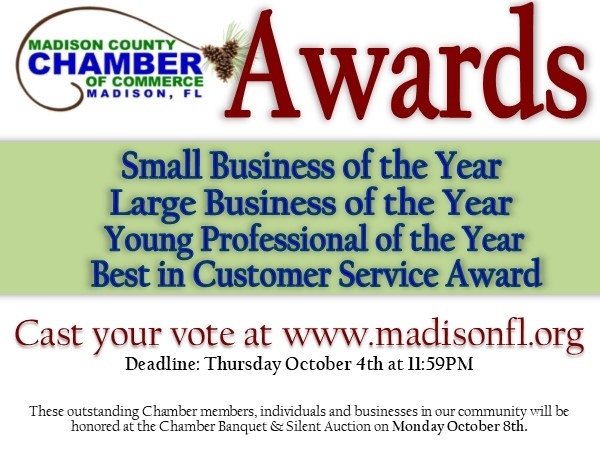 Awards are intended for Chamber Members reflecting the highest level of professionalism, knowledge, integrity, stewardship to the community, investment in the future of business and growth in Madison. Nominations will be open September 3 – September 25that midnight and Voting - September 27th – October 4th at midnight. Chamber Member that is dedicated to customer and client services. Displaying consistent quality service and courtesy in the community.